You are Currently on the Main Deck! Ernie, chief engineer of Ross Revenge died in the early hours of October 19th 2001. Born in Middlesborough, Ernie joined the army as a young man serving for six years in the tank corps. He did not talk much about his time in the military, but we believe that he was injured in action. Certainly in later life when he could no longer work he was supported by his military pension. Moving to Hull, he took work on board the trawlers operated by Boyd Line and became chief engineer of one of their new ships. Ernie became so possessive about his ship that he began to resent other people working on her and thus thought he should have a career change. He saw the vessel Sea Harvester being completed and took the job of sailing her with a small crew all the way to New Zealand where he worked the ship for six years, bringing his family over to join him. He also worked for a spell in Australia. Whilst in New Zealand, his health showed early signs of deterioration and doctors suggested that he had been exposed to radiation. Another part of his military life that he did not speak of was volunteering to work at the atomic weapons research base at Harwell. When doctors requested that his army health records be sent to New Zealand it was found that they had mysteriously disappeared. He returned to the UK but worked for spells in the Persian Gulf. He then joined Associated Fisheries, part of the Ross Group and became fleet engineer in overall charge of the entire fleet. He recalls that at the height of the fishing industry 750 ships were docked in and around the Hull Fish Docks. 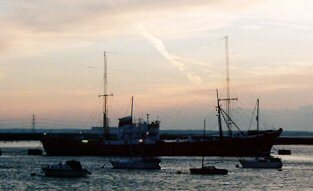 Radio Caroline found Ernie when he was working at a shipyard in Lowestoft in the mid 80's. By then he was really not fit to go to sea in the conventional sense, but agreed to join Ross Revenge one of his former ships since she was at anchor. When Ross Revenge broke adrift and seemed likely to be washed up on Margate beach, Ernie saved the day. The ships steering gear on the bridge would not function, so Ernie took a hand held compass down to the steering flat at the stern and steered the Ross ' blind ' back in to international waters. He saved us again when the 300ft tower collapsed in to the sea, threatening to capsize the ship. In dreadful weather conditions and great danger Ernie cut away the many stays which were still tethering the sunken mast to the Ross. Ships logs of the era show that at this stage Ernie was feeling continually unwell and evetually he had to give up his duties, Being a chain smoker, when he contracted severe chest pains and a constant cough many of us assumed the worst. By 1991 when Ross Revenge was shipwrecked we had lost touch with him entirely, but on placing an article in a Hull paper entitled ' Radio Call For Ernie ' he immediately contacted us, proclaiming that he was fine fit and well. He was not of course, but he put up a good show. Taking charge of the ruined ship he explained that while she was in poor shape he could fix her up for a cost equivalent to that of a small new car. We did not have the money for a small new car or even a small old one, but he set to work regardless. In late 1993 Ross Revenge was able to leave Dover with Ernie on board but on new years eve, possibly as a result of his extreme exertions in repairing the ship, he suffered a stroke. Even then he soon discharged himself from hospital, recuperated and rejoined the ship at Bradwell and finally in London. Thereafter while he was not able to travel down South any longer he continued to advise Peter Clayton and Peter Moore virtually to the present day and he was always hopeful that his health would rally so that he could at least see his ship again, but sadly this was not to be. Although he kept the true situation from us it seemed that doctors told him that he had the option of letting nature take its course or of submitting to a major operation giving him a modest chance of survival. Ernie had a triple heart bypass and other surgery on October 12th 2001 and seemed at first to be making a good recovery. A release date from hospital was even suggested. However on Thursday 18th his family found him in poor spirits and he passed away a few hours later. Those of us who worked with Ernie are proud to have had that opportunity. We all thought that he was indestructible and his loss is a shock to us. Ernie was buried in Hull on Friday 26th October. Peter Clayton, Peter Moore and others attended the funeral. In summing up Ernie, Peter Moore commented that he was ' the finest man I have ever met '. We hope that this is a fitting epitaph. Our sympathies go to Betty, Ernie's wife and to his children ' young ' Ernie, Pat and Liz. Reproduced here from the Official Radio Caroline Website.